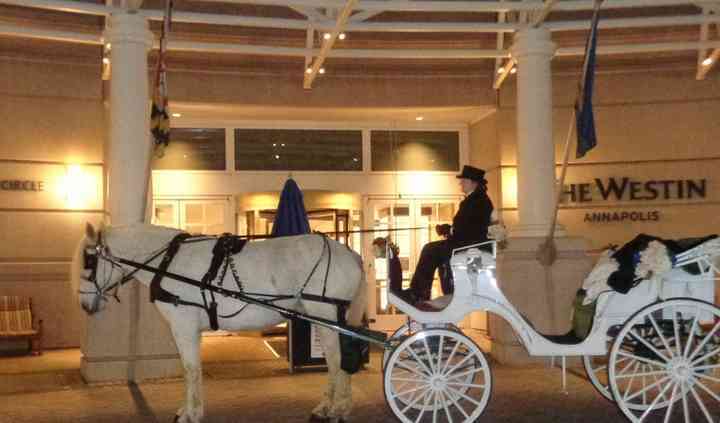 Carriages by Karen, LLC is a transportation company based in Manchester, Maryland, that specializes in horse and carriage services for weddings and special events. 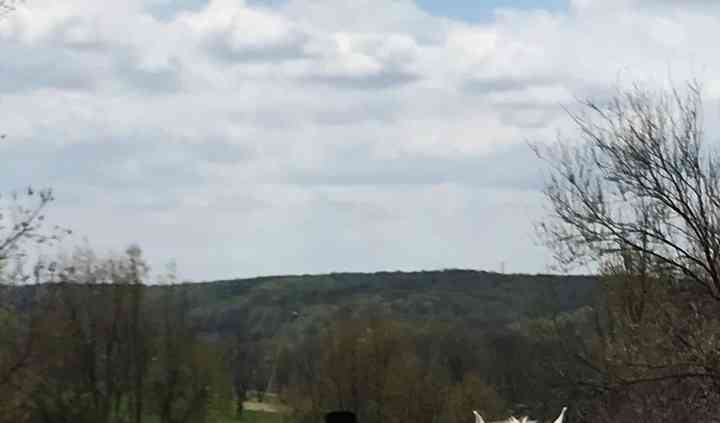 Owner Karen prides herself on delivering one-of-a-kind transportation on your wedding day, and all of her horses are well-trained and professionally groomed. Carriages by Karen, LLC is devoted to giving superb customer service, so you arrive in style, relaxed, and ready to walk down the aisle. Karen founded Carriages by Karen, LLC in 2013 after more than 22 years driving carriages and leading tours in downtown Annapolis. Karen inherited her passion for horses from her father, who taught her how to ride when she was a child. Nowadays, Karen lives in a farm in North Carroll County, Maryland, with her family and owns several horses. Beautiful horse and carriage for your wedding. Karen made our daughters and son-in-laws wedding even more special and memorable. Karen and her magnificent mare made for quite the entrance. Karen is flexible and affordable. 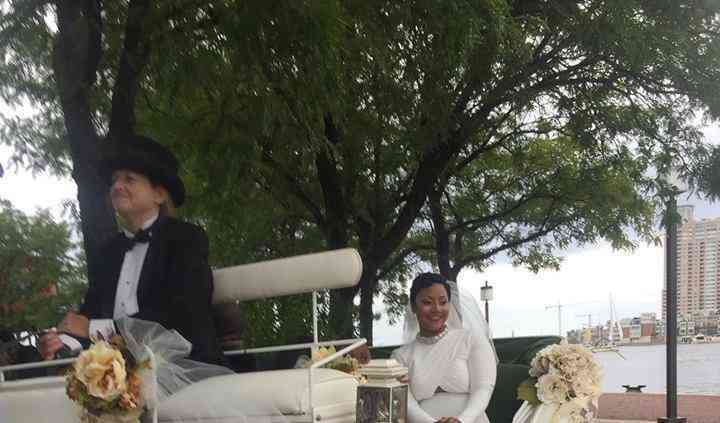 Read more Karen made our daughters and son-in-laws wedding even more special and memorable. Karen and her magnificent mare made for quite the entrance. Karen is flexible and affordable. This was a wonderful wedding idea! Carriages by Karen was a beautiful, fantastic idea! Karen is ideal to work with. 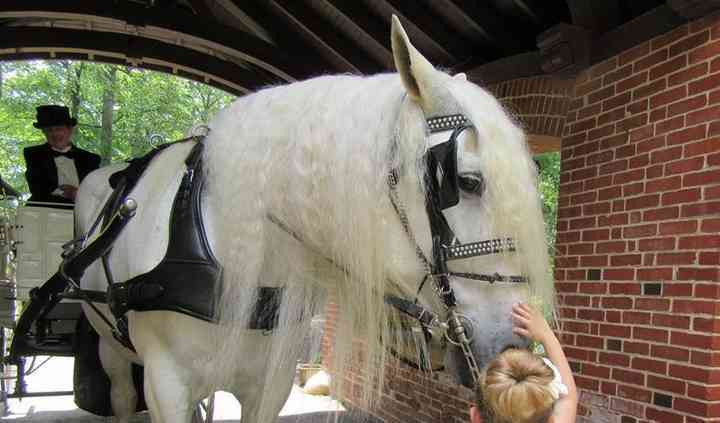 I wanted the carriage ride to be a surprise for my daughter, and Karen and the wedding coordinator at the U.S. Naval ... Read more Academy did a fantastic job keeping it all a secret. The carriage was gorgeous! The flowers were a perfect match to my daughter's dress and flowers. We, sadly, ran in to quite a rainstorm, but Karen did a tremendous job keeping my daughter, my husband, and one of our flower girls dry and safe. After the wedding, my daughter and her new husband had a celebratory ride through the Naval Academy grounds (no rain by then! ), and everyone they passed stopped and looked quite impressed. I don't think you'll find a better carriage ride anywhere! PS: The carriage is straight out of Pride and Prejudice - my daughter's favorite! It was a highlight of the day! What a nice addition to the Bride coming down the Aisle! Karen is not only professional, but her carriages are gorgeous and her horses are very well maintained, even with their Shoes polished! Read more Karen is not only professional, but her carriages are gorgeous and her horses are very well maintained, even with their Shoes polished!